It's that time of year again - Smoky not Smudgy is back for the 7th time! For those of you not familiar with this charity event, this is something a friend of mine started some years ago and I also got involved in organising. It has since grown exponentially - click here to read all about how it began. You can also see photos from the event in 2013 and 2012. This year on 16th November there will be two fashion shows, a bazaar with a huge range of clothing, accessories, jewellery and art, food, talks, performances and more! Some of the companies taking part include Aab, Mirage by Numra, Abaya Collection and Hijab Candy. 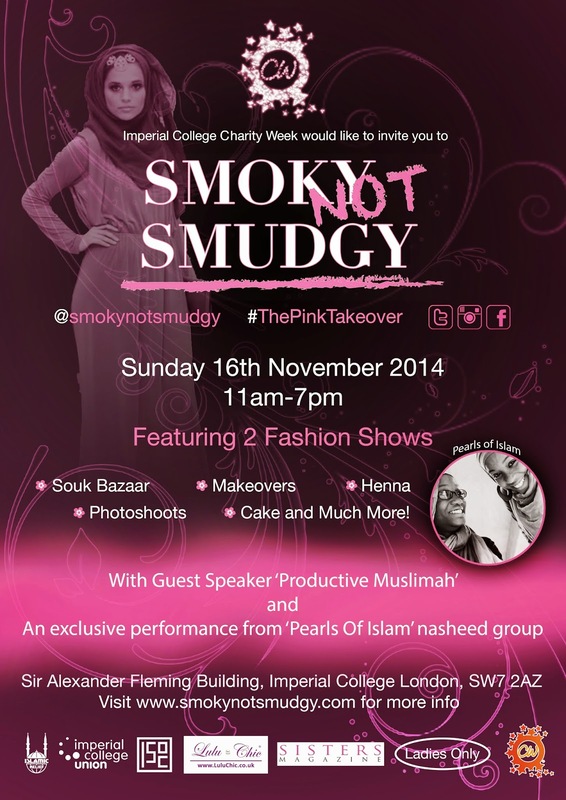 Check out the Smoky not Smudgy website for all the information and details of how to buy your fashion show tickets. See you all there!